The Rijksmuseum De Meesterwrken is currently undergoing an extensive renovation until 2013. With an unrivaled collection of works from the 17th-century Dutch Golden Age, the museum has selected highlights to display. My respective encounters with two masterworks marked my visit: Jan Vermeer's The Kitchen Maid (1658) and Rembrandt's The Night Watch (1642). 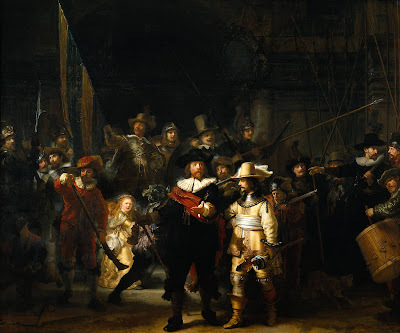 The Night Watch (less popularly known as The Militia Company of Captain Frans Banning Cocq and Lieutenant Willem van Ruytenburch) is stunning. Rembrandt was commissioned to paint a towering group portrait of an Amsterdam militia company. Amidst the throngs of visitors to the Rijksmuseum, I was dwarfed by the painting and was gobsmacked as I admired both Rembrandt's use of light and the virtuosic way he created a sense of movement in the scene. 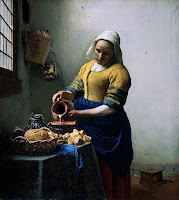 By contrast, Vermeer's The Kitchen Maid is a much smaller painting in size and subject. It's a simple scene: Daylight streams through the window as a maid pours milk from a jug into a bowl. But Vermeer's use of naturalistic light to infuse life into this domestic moment is masterful. I have seen both works reproduced in books or slides, but nothing compares to visiting the works and seeing them in person.